View on Africa: Côte d'Ivoire: which challenges remain in the peacebuilding process? On 30 June 2015, the government of Côte d’Ivoire announced the end of the disarmament, demobilisation and reintegration (DDR) process, one of the key components of its post-conflict reconstruction strategy. According to the government, 85% of former combatants have been successfully disarmed and reintegrated into society. While this might be good news, particularly since Côte d’Ivoire is preparing for a major presidential election in October, was the declaration perhaps premature? Also, many former combatants might have been left out in the process, and could be become a potential threat to the peacebuilding project. 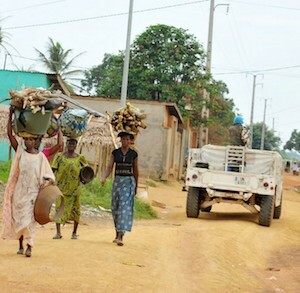 Authorities in Côte d’Ivoire identified the DDR process as one of the key priorities for post-conflict reconstruction. A single entity was created in August 2012 to manage the process – the Authority for disarmament, demobilisation and reintegration (ADDR). It identified 74 000 ex-combatants to go through the process. By the deadline of 30 June 2015, ADDR declared having disarmed, demobilised and reintegrated close to 60 000 ex-combatants, which is 90% of its target. It collected 20 000 weapons and 1 million rounds of ammunition. Three destinations were identified for demobilised ex-combatants: back to school, trade and agriculture. Given the poor level of education of most ex-combatants, trade and agriculture absorb the majority. Discrepancies noted between the number of demobilised combatants versus the weapons collected are justified by the fact that not all ex-combatants have weapons to surrender. Ex-combatants could destabilise the internal political dynamics, thereby weakening or undermining the peace process. Some of them are also involved in criminal activities. Government estimated that there are between 2 000 and 5 000 non-registered ex-combatants, some of whom are still in cantonment sites in Abidjan and elsewhere hoping to join the army. In May, on the instructions from the governments, a number of sites were closed and ex-combatants asked to join the DDR. Due to the difficulties that the ADDR faced during the past three years, it is necessary to develop a post-June 2015 strategy to deal with residual elements that might be left out. In response to this, the government of Côte d’Ivoire, after declaring its mission accomplished, dissolved the ADDR and created a Centre for Coordination of Social Reintegration to deal with the residual elements. Some of the ex-combatants linked to the former leader Laurent Gbagbo still lack confidence in the process. A large group remains in exile. Ex-combatants and former military commanders still have considerable influence on non-registered ex-combatants. In Côte d’Ivoire successful DDR stories can end up becoming a nightmare for other countries. For example Liberia has become a contributor to armed conflicts through the actions of mercenaries as seen during the post-electoral crisis in Côte d’Ivoire. Will the government be able to sustain the current achievements? Do you want to know what's happening in Africa? Where it's happening and what it means for the continent's many actors? Join the new ISS View on Africa weekly briefing every Wednesday from 11h00 - 12h00 CAT at the ISS in Pretoria or online. ISS researchers from Dakar, Nairobi, Addis Ababa and Pretoria provide expert analysis of major events and trends in Africa. Introductory remarks are followed by discussions among participants. Attend the briefing in person or online via VoiceBoxer on your computer (http://app.voiceboxer.com/presentation/nIUH9ofrF3/register). To join the briefing online, simply click on the link above, follow the on-screen instructions and select your language preference.